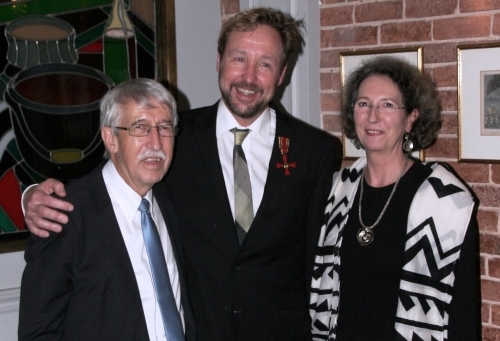 On Saturday, December 3 2016, the German Consul General Walter Leuchs (German Consulate General Montreal), on behalf of the German Federal President Joachim Gauck, conferred the Federal Cross of Merit on Ribbon on Laurence McFalls. For more than 25 years, Laurence McFalls has served as an academic ambassador of German Studies. He has been active as a bridge builder and a translator between Canada and Germany, and he has engendered a sustainable impact on German-Canadian academic relations. He belongs to the pioneers of research about the GDR and the democratic revolution in East Germany. Last but not least, he was instrumental in the establishment of sustainable academic institutions promoting the internationalization of research and teaching in the field of the humanities and social sciences at the Université de Montréal, at the Universität Trier and the Universität des Saarlandes. For his achievements, he deserves highest recognition. Laurence McFalls started his academic career with a dissertation about socialism and winegrowing in Languedoc, but soon discovered his love for German history, culture, sports, and politics. In 1990 and 1991, he received a postdoc fellowship from the German Marshall Fund of the United States, allowing him to do research about the “Wende” and the politics of German unification. His book Communism's Collapse, Democracy's Demise: The Cultural Context and Consequences of the East German Revolution, published by Macmillan in 1995, is still one of the best analyses of the political and cultural context of German-German relations before and after the East German Revolution. As Professor of Political Science at the Université de Montréal, Laurence McFalls became the leading actor in the institutionalization of research about the two Germanies in Canada. He organized a tri-national Seminar in Intercultural Communication, and an annual intensive seminar for MA-level students from Lyon, Montréal, and Saarbrücken at the Europäische Akademie Otzenhausen (EAO) in collaboration with the ASKO-Europa-Stiftung. This latter initiative helped to lay the groundwork for the subsequent creation of a binational credited seminar and the IRTG Diversity, the first German-Canadian doctoral training school in the humanities and social sciences that today comprises a group of more than 60 faculty members and doctoral researchers on both sides of the Atlantic. The IRTG Diversity is very proud of one of its speakers receiving the “Bundesverdienstkreuz”. We would like to thank Laurence for his energy, flexibility, and professional creativity. His input and personality are essential for the success of our transatlantic partnership.